Spaceworks matches creative entrepreneurs with vacant retail space around Tacoma. Write@253 occupies a building in Tacoma's Hilltop neighborhood. Maybe you’re an artist with a vision to add some color to your city, or perhaps you’re a creative entrepreneur who isn’t quite sure how to manifest your business. Whether you need a space to make your project happen or are in need of some entrepreneurial support, Tacoma’s Spaceworks is ready to help. Spaceworks matches creative entrepreneurs with vacant retail space around Tacoma. Write@253 occupies a building in Tacoma’s Hilltop neighborhood. Founded in 2010 by Tacoma’s Arts Administrator, Amy McBride, Spaceworks was created to provide artists and creative entrepreneurs with the guidance and space needed to launch their projects. In addition to providing support for creative locals, Spaceworks has also helped to make the city of Tacoma a more vibrant place by activating empty storefronts with creative enterprise and art, adding more color, culture and commerce to the city. Working with building owners to activate empty spaces, Spaceworks is able to provide artists and creative entrepreneurs with a place to set-up their studios, businesses and more. Spaces are secured on a month-to-month basis with free use for the Spaceworks tenant for up to six months. After six months, the tenant may decide to continue renting the space at a monthly rate as determined by the building owner (just like a regular tenant), or they may choose to rent another space that better serves the function of their business or project. Filling these empty spaces not only benefits the Spaceworks tenant by providing a free space to help launch their creative endeavors, but it also benefits building owners by filling their empty storefronts, making their property more vibrant and appealing to potential renters. The result of this? A relationship that mutually benefits both the Spaceworks tenant and building owner, while simultaneously strengthening the community through arts and commerce. Fabitat is a start-up project of Spaceworks, still going strong after two years. If you’ve visited Tacoma’s Hilltop neighborhood in the past few years, you may have noticed some things have changed. In 2011 Spaceworks acquired a building on Martin Luther King Way. The building has four bays, all of which were, at the time, empty. 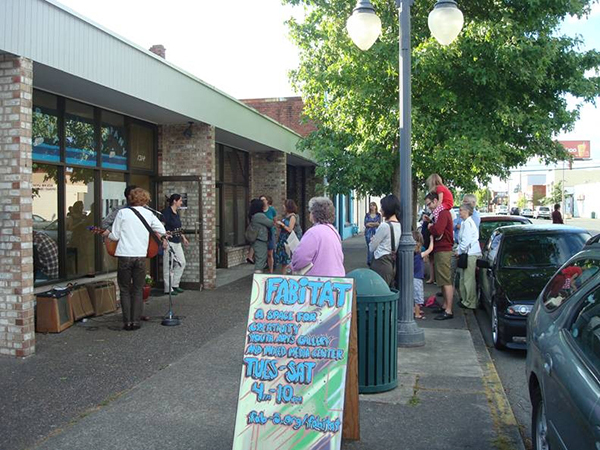 Now, two years later, all of the spaces are rented and include Spaceworks startups like Fabitat, a creative enterprise that connects youth with arts professionals, and Write@253, a free writing center for the community. Another noteworthy entrepreneurial Spaceworks projects that has made its imprint on the city is Tinkertopia. 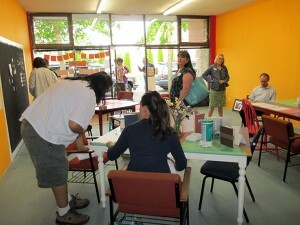 Earlier last year Tinkertopia was placed in a University of Washington owned storefront on Tacoma’s busy Pacific Avenue. 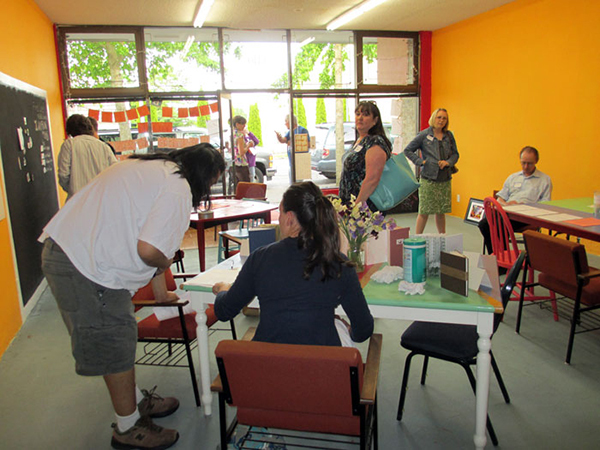 Since its grand opening in July of 2013, this “creative reuse center” has thrived by providing the community with a unique and affordable selection of art materials. If you’ve spent some time in downtown Tacoma looking for some chic menswear, you may have stumbled into another Spaceworks project, Feather & Oar. Or, perhaps you wanted to change the look of your apartment and made a visit to Poppy & Co. This Spaceworks project, specializing in upcycled and gently used vintage furniture, has, like others, grown significantly since its tiny Spaceworks beginning. Tinkertopia, is a “creative reuse center” thriving on the busy Pacific Avenue in Tacoma. While Spaceworks has been successful in helping creative entrepreneurs start their businesses, they’ve also made a big impact on the arts community through the installation of Artscapes. Artscapes places two and three-dimensional art installations in vacant storefronts and spaces throughout the city. Since 2010, Spaceworks has helped place more than 75 Artscapes throughout the city of Tacoma. Poppy & Company is another business, specializing in upcycling, that got its start through Spaceworks. As Spaceworks continues to grow, Joy explains that Spaceworks is looking at moving into new neighborhoods that have expressed an interest in seeing Spaceworks in their communities. Have a project idea? Reach out to Spaceworks, sign-up for their newsletter, and get in touch with Heather Joy. Creative-minded Tacomans rejoice – Spaceworks is here to help you.